Chicago Post (on March 17, 2012), we have built a record of being unafraid to offer criticism of local law enforcement. For us, that typically means criticizing police brass who have failed the rank-and-file and failed all of us, really, with bone-headed strategies like CompStat, dubious and most likely wasteful uses of technology like ShotSpotter, and communications initiatives that appear to be little more than public relations fluff--like online CAPS meetings. 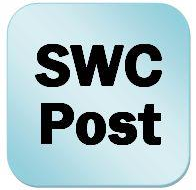 Beyond the brass, however, when it comes to our police on the front lines, we are proud to say that the Southwest Chicago Post has earned a reputation as one of the most--if not the most--unabashedly pro-public safety/anti-crime news organizations in all of Chicago. We applaud our men and women in blue--particularly in the CPD Eighth District--when they swarm like angry bees in pursuit of robbers, thieves, burglars, vandals, gangbangers and other parasites who threaten our well being, our property and our way of life here on the Southwest Side. We support their efforts with full vigor and urge everyone else to do the same. That's why we urge all law-abiding men and women on the Southwest Side to be on the sidewalk at Archer and Harlem (by Joe & Frank's) at noon, Saturday, April 2. Just 60 minutes of your time--1/24th of your Saturday--is what you need to give. Neighborhood Watch, which is organizing a peaceful yet powerful rally of support for our local police--particularly our Eighth District Police. Wear blue, bring a flag to wave and make an upbeat, positive, boldface sign that shows passing motorists that you support police. Bring your kids and grandkids, too. Lead by example and teach them the importance of respect for authority, the value of law and order. 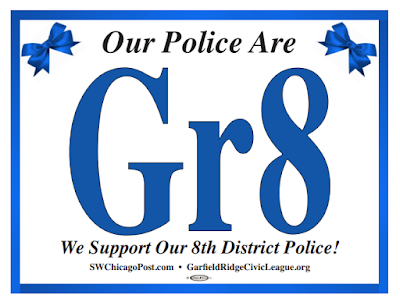 Our police--particularly Eighth District Police--have taken a bad rap, an unfair rap, from protesters and their pals in the downtown news media, who have attempted to tar and feather our men and women in blue--the vast majority of whom are smart, hard-working, brave people who confront danger so the rest of us don't have to. And as you might imagine, almost none of these carping critics--protesters and members of the downtown news media--actually live here on the Southwest Side. Frankly, we're tired of hearing their whining. So are the men and women of the Garfield Ridge Neighborhood Watch. See you at Archer and Harlem at noon Saturday, April 2? John, I wish I could be there. 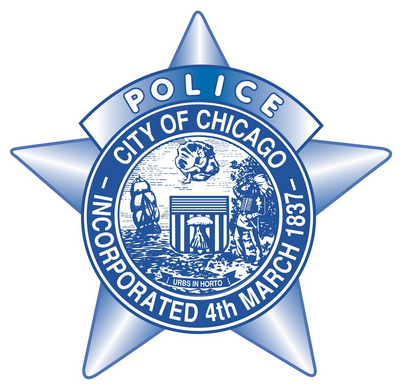 You are correct those men and women on the CPD, especially the 8th district work much harder and respond to more calls, than any average person understands. Please keep up the great work. I'm sorry, I meant Joan, not John.